Born at Nashua, Iowa on 6 February 1865, son of Jacob D. Hall and Anna M. Brooks, he grew up as a farm boy before taking employment at a bank in Iowa. He rose through the ranks to cashier and then President of the First National Bank of Hartley. He began investing in land in Western Canada in 1902 and moved to Saskatchewan in 1906 to open a general banking business, which became the Hall Company Limited, with its head office in Winnipeg, where he came to reside. 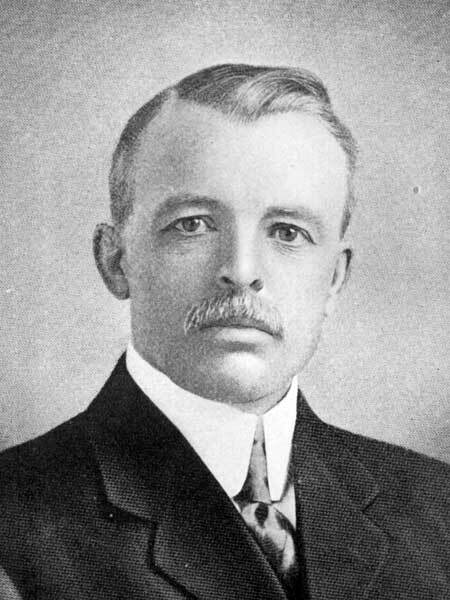 He also founded the Central Grain Company and was President of the Security National Insurance Company of Canada, which operated a large line of grain elevators. His Sheldon Farm Company operated a 7,680-acre farm near Hanley, Saskatchewan. He was President and Managing Director of the Dominion Loan and Securities Company, President of the Pioneer Farm Company, Vice-President of the British North Western Fire Insurance Company, and a director of the Western Elevator Company, Equitable Trust Company, and A. Macdonald Company. On 12 October 1892, he married Ella Inman (?-?) at Milford, Iowa. They had three children: Carl I. Hall, Frank E. Hall, and Aileen E. Hall. He was proud of his status as a naturalized Canadian, and belonged to the Manitoba Club, St. Charles Country Club, Winnipeg Golf Club, Masons, and Shriners. He resided at 611 Wellington Crescent in a large, two-storey brick building that was later incorporated into the Shriners’ Hospital for Crippled Children. He moved to Vancouver, British Columbia in 1928 and died there on 18 April 1939. “Elmer E. Hall dies at Vancouver,” Winnipeg Free Press, 19 April 1939, page 9.